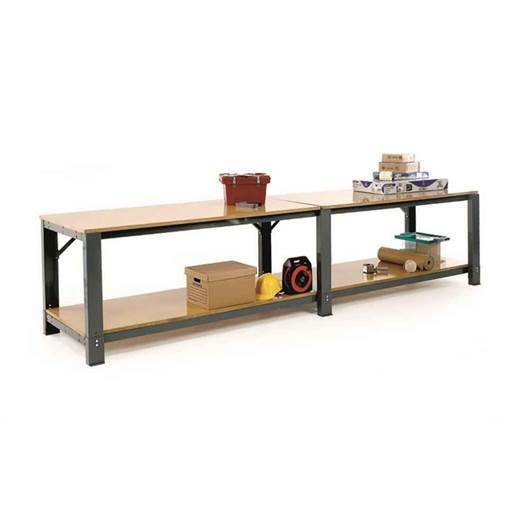 A heavy duty range of workbenches designed to offer either individual units or indefinite lengths of benching to suit individual requirements. Available up to 1500mm deep to enable working from both sides. Working height is adjustable in 25mm increments up to a maximum height of 940mm. Standard working height is 840mm. There is a choice of 3 worktops: 28mm Vinyl, 25mm MDF or 25mm Plywood. Main Benches are supplied fully assembled. Extensions are supplied knock down and are not available on their own. Optional extras available, please call for details. Customise your bench as required by choosing from the available factory fitted optional extras:* Bench Extensions* Lower Shelves* Lockable drawers and cupboards* Upper Shelves* Light and Tool Rails (Support Legs also available to suit)* Electrical Power Point.